I am looking for a camper with a Class C that uses a Trav'ler Winegard Sat Antenna. First problem is finding a open space 44"by 34" area. 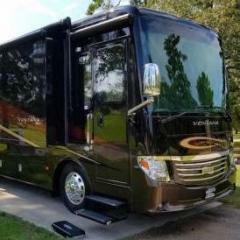 My Class C is a Winnebago Cambria 2014 30J. Just not to sure of clearance and trees above the roof at almost 3 feet. So if you run this setup on a Class C I need some advice. Where have you been the last 9 years? No could you enlighten me? By the way it makes it easier to give good answers if you put your RV and basic info in your signature. Like manholt has. He can be an example for you. Mjarry, I too am interested now that you opened the door. What do they say about us Texans? Mailman, I have a Winegard Traveler mounted on my Class A diesel pusher and it sits lower than my a/c units during travel. You do understand it folds down when traveling. I only asked, because you became a member of the Forum, November 3, 2010 and just now started posting! It was not meant to be derogatory, just a innocent question! As for NH, my dead wife, was born & raised in Lebanon, NH...I spent a lot of summers there, in the 1970's & 80's. Now, like Bill & Jim, I too would like to know, "What they say about Texans?" I guess I am all alone with Satellite technology, or shall I say, lack there of. Our HR also has in motion Tracstar, I have never used it. We connect to the CG cable, if none I use the Batwing antenna, which surprisingly works very well. About the only time I use the TV is at night waiting for everyone to get ready for bed and in the AM to watch local news. You're not alone. We also only have an OTA antenna for television. If we want to watch something else, I'll stream it through an app on my phone and mirror the screen to the tv. I watch the Golf ch., Fox News on occasion! Linda looks at stuff, I never heard off and movies, lots of movies! Richard, how do you, " mirror screen to TV?" I've got a Samsung Galaxy - there is an option to mirror the screen to the USB output. I just plug the cord from the phone into a USB port on the TV. It's easy since I have a Samsung phone and a Samsung TV, but I believe that it's also possible to do this with other brands of TVs. I used to do this by using a USB-to-HDMI converter when I had a different brand of phone. I also bring along a Google Chromecast. The latest version of the Chromecast allows direct streaming from a device to the Chromecast without going through a wifi first. This works, but it took me a few tries and re-reading the directions to do it the first time. Much easier to just plug the phone into the TV. If you bring along your laptop, you can also usually just use the TV as an external monitor - sometimes this works through a USB-to-HDMI converter and other times you need a laptop with it's own HDMI output. I do it in our Apple Club meetings. The adapter I use is lighting to hdmi. There are two different ones on the market. I bought the one that also has another lighting female connection to insert power to keep my iPhone or iPad charged while connected to the TV. With research the Winegard Trav'ler dish sk1000 or directv swm-3 can be interchange on the top end with kits to change with either system. BUT use the main unit on the roof. So, I have a SD G3 on the roof at this time. BUT with the providers playing with SD or HD at this time you the customer has to be able to change with them. So I believe the Winegard Trav'ler is the best option for installing one time to the roof, or upgrading the hardware on the fly. This is the reason for thinking out loud. The problem is finding a clear 44" by 34" clear Flat spot in roof area on the class C to install the system. I have a Class C Winnebago 32 ft Itasca Cambria 30J, with the sky light close by on the roof, this is going to be interesting to say the least. Thanks for all the reads. Is there any Class C units out there that run this setup?